Welcome to the 2017 season for the St George’s Peregrines. It’s good to be back, and even better to see the adult pair back around the nest. In truth, they’ve not been away from the St George’s area since the young birds fledged back in the summer. More than any other year, the birds have remained around the nest territory throughout the autumn and winter, although they’ve not always been visible on the webcams. 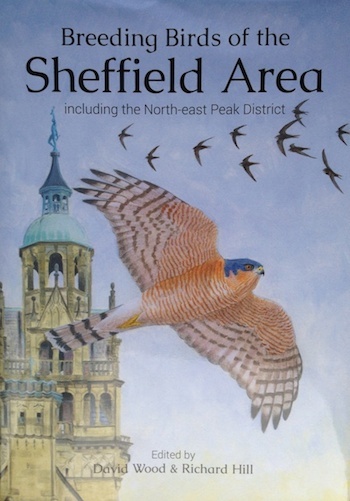 They’ve also been regularly seen at a couple of other favoured sites around Sheffield, but one of those has been refurbished, with the loss of the ledges they preferred, and this may have resulted in their more consistent presence at St George’s outside the breeding season. A couple of weeks ago, Ian Knowles and I went up the church tower to check that everything was in good order ahead of the anticipated breeding season. All was well and the female was in situ, oblivious to our presence above her as we looked out to the nest box below. It made for an unusual angle for a photo opp. She did eventually notice us and took off, circling the church calling loudly: clear indications that this remains very much her territory. Another reason for the trip up the tower was to look at the possibility of locating a thermal camera as part of a PhD project. This has now been fitted and will allow the researcher to see if prey items are brought in fresh or if they have been cached. Given the low resolution of the image it is not being streamed, but the results it generates will be made known in due course. We have other potential developments in mind and have set up a donations page for the Peregrine Project, available via a link from the top of the menu on the right-hand side of the homepage. If you enjoy watching the webcams, please support us with a donation! Details of the things we hope to do are included on the donations page. 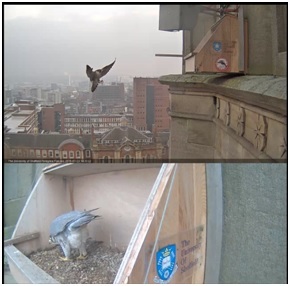 Sheffield has had a snowy weekend, but on Friday the pair was on the nest platform, bowing to each other. This is a clear marker of territorial courtship behaviour and the first clear sign I’ve seen in 2017 that breeding activity is getting under way. The ring on the leg of the male, visible in the photo above, together with his distinctive dusky cheek pattern, confirms that this is the same male that has bred successfully in Sheffield for the last 5 years. The identity of the female (below) is less clear – we need some DNA testing to know for sure, and for that we need funds to purchase the materials that enable such scientific work. So, welcome back and do consider making a donation to support the project and the work around it. We’re fortunate to have the birds with us, and want to do all we can to ensure that success continues.